Books, Chemtrails, Depopulation, Eugenics, Genocide/Democide, GMO, Government, HAARP, Military, Sterilization, United Nations, W.H.O. Important book with insights into dangerous practices that plague our country and the world – the stuff that ThoughtCrimeRadio works to drag out of the shadows into the public eye. There are those (self-appointed, unelected “leaders”) who think they “own” us and deserve to make decisions that affect the lives of everyone on the planet… they don’t. We are not their cattle. The “cattle” principle is the one that fuels abominations such as “pizzagate”. To understand more about their arrogant, entitled mindset and the abuses they wreak on us and even their own, see TCR staff writer Kerth Barker‘s memoirs Angelic Defenders & Demonic Abusers and Cannibalism, Blood Drinking & High Adept Satanism. When you read Kerth’s books and think about it for a while, it all makes perfect sense… there are those who believe their “god” rewards them for the evil they do… turning every value decent people hold, 180 degrees. After World War II, world leaders were so weary of brutal conflict that they agreed to find a way to peacefully coexist. Since then, peace and prosperity have depended on an ultra-secret effort to reduce human fertility, so as to defuse the population bomb before nations outgrow their natural resources and are tempted to take the resources of weaker neighbors by force. Instead of waging open war on each other, the military-industrial establishments of nation states have been empowered to use chemical and biological weapons to wage a silent war on the reproductive ability of the global population. Consequently, population control since 1945 has been the pivotal element of the international world order and the world’s best-kept secret, turning the basic elements of life into weapons of mass sterility and selective morbidity that affect nearly every human being on the planet. Author Kevin Galalae unravels not only the carefully concealed methods and means of population control, but also the insurmountable obstacles that stood in the way of legislating family size, and that drove the population control effort underground. Paradoxically, religion and democracy, which embody the noblest values and ideals of mankind, are ultimately responsible for the odious crimes of the Global Depopulation Policy. Monsanto tells the public it is not their job to ensure safety of their products; it is the job of the FDA. The FDA tells the public it is not their job to ensure safety; it is the job of the food producer. Patricia says it’s your job to ensure the care and feeding of your body… and mind. If you put low-lead gas into a car that requires diesel fuel, it will not run well – and if you put diesel fuel into a car that requires low-lead gas, it will not run well. If you put sugar in your tank, it will destroy your engine. Try running it on grains and other plants sprayed with glyphosate, the deadly ingredient in Roundup. Please watch what you put into your mouth very carefully, because if you put commercially (as opposed to organically) grown foods into your mouth, you might just be taking your life into your own hands. If your body is less than radiantly healthy, you might want to check what is going into it. And what is the rational response when one discovers s/he is being poisoned by industrial foods?… to stop patronizing the criminal organizations that are poisoning the world’s farms. Don’t buy it; don’t eat it. You owe it to yourself… and you’ll save when you don’t have to buy pharmaceutical drugs to “cure” whatever it is that ails you, which was caused by . Grow a garden… without chemicals. Just soak the soil, put a seed down, cover it with a little soil, keep watered until it sprouts and then water gently after that. Things grow! Nature is not stupid. It’s been doing quite well for thousands of years without chemicals that require hazmat suits. The yield on organic farms is no less than that on farms sprayed with chemicals. We’ve been had, folks. Let’s turn it around. In WWII, everyone had a “Victory Garden”. Let us now declare our victory over a food system that has made us sick. And now to Jon Rappoport’s article on “our friend”, the Food and Drug Administration. July 26, 2000, Journal of the American Medical Association, Dr. Barbara Starfield, Johns Hopkins School of Public Health, “Is US health really the best in the world?”: Medical drugs kill 106,000 Americans per year. That’s a million killings per decade. Every one of the killer drugs is certified as safe and effective by the FDA, the Agency tasked with protecting the health of the American people. In a stunning interview with Truthout’s Martha Rosenberg, former FDA drug reviewer, Ronald Kavanagh, exposed the FDA as a relentless criminal mafia protecting its client, Big Pharma, with a host of mob strategies (“Former FDA Reviewer Speaks Out About Intimidation, Retaliation and Marginalizing of Safety,” 7/29/2012). Read much more at Use of term “FDA” should always trigger a warning « Jon Rappoport’s Blog. Other good reads are: Ralph Nader and James Turner’s The Chemical Feast and Seeds of Deception by Jeffrey Smith. TRUTH: Glyphosate weed killer causes cancer, infertility, kidney damage and birth defects. And it’s found in instant oatmeal! TRUTH: Statins destroy brain function and cause dementia and memory loss. They also cause muscle fatigue and crippling weakness. TRUTH: Many foods contain powerful anti-cancer medicines that can destroy tumors far better than chemotherapy. Try turmeric! SCIENCE LIE #4: Biosolids are “organic fertilizers” that are safe to use on home gardens. TRUTH: Biosolids are actually recycled human sewage and industrial waste from cities. They’re extremely toxic and loaded with heavy metals, industrial chemicals and prescription drugs. TRUTH: Early detection actually destroys lives with unnecessary “treatment” for cancers that weren’t real or didn’t pose any threat to the patient. More people are killed by cancer treatments than by cancer! TRUTH: All that so-called “science” is false science fabricated by the biotech industry that profits from selling GMO seeds. Scientists who oppose Big Biotech are threatened into silence. TRUTH: Mercury, a toxic heavy metal, is still used in flu shots given to children. All vaccines preserved with “Thimerosal” contain mercury. Mercury is toxic at ANY dose! TRUTH: Vaccines’ link to autism was already admitted by CDC scientist and whistleblower Dr. William Thompson, who helped hide the fact from the public. TRUTH: CO2 is food for plants! Rising CO2 actually “greens” the planet and accelerates reforestation, plant growth and food crop production. TRUTH: Drugs only mask disease symptoms while interfering with human physiology to cause toxicity and side effects. They never “treat” the cause of disease. TRUTH: Unborn babies are alive and conscious. They can feel pain, experience joy and are aware of what’s happening to them. TRUTH: Nearly all outbreaks of measles and mumps occur among children who were already 100% vaccinated! Faced with resistance from civil society, pressured by an increasingly volatile world, handicapped by the loss of the cover of secrecy, disarmed of plausible deniability, and driven by the sustainability agenda, the UN and national governments have become desperate and isolated and have been forced to adopt a new strategy of population control that no longer relies on their lost ability to turn man against man but on a newly gained ability to turn nature against man. Population control via chemically-induced sterility and morbidity over the course of a lifetime through the adulteration of the basic elements of life with endocrine disruptors is being phased out as more ambitious depopulation targets via vaccine-induced apoptosis through mandatory immunization programmes are being phased in. This new methodology of subverting fertility and increasing mortality, the two means of stable populations, implemented under the guise of societal interventions for public health outcomes with the help of a new global instrument of coercion called ‘public health emergency of international concern (PHEIC) requires far fewer financial and human resources but entails far greater risks for mankind and for all life on earth. This methodology allows for the concomitant pursuit of peak population and peak life expectancy by genetically programming sterility and morbidity early in life through childhood vaccines so the engineered demographic transition is accomplished worldwide by 2050 in the most economical fashion and with the furthest timeframe of responsibility, but also with little or no regard to the integrity of human life, fully outside the law and in defiance of constitutional guarantees. Choose “PDF” tab to download the entire study. Read Propaganda, by Edward Bernays. Read Fahrenheit 451, by Ray Bradbury. Get rid of your television. Preferably, destroy it. Clear your mind. Make a commitment to not use mind-altering substances for 90 days. If you fail, go to an AA meeting and restart the 90 days. Read The Creature from Jekyll Island: A Second Look at the Federal Reserve – 5th Edition, by G. Edward Griffin. Read 1984, by George Orwell. Hold internet authors accountable by citing fallacies. Read The Law, by Frédéric Bastiat. Make a list of your natural rights. Read The Constitution of the United States and The Bill of Rights. Read Animal Farm, by George Orwell. To discover who your two senators and one congressman really represent, do a little research at https://www.opensecrets.org/ Make a list of “your representatives” 10 biggest donors and send the lists to your senators and congressperson by email or letter. Read War is a Racket, by Smedley D. Butler. Read On Killing: The Psychological Cost of Learning to Kill in War and Society, by Dave Grossman. Watch this TED Talk, A radical experiment in empathy, by Sam Richards. Read Anatomy of the State, by Murray Rothbard. It’s remarkable that the mainstream media don’t think that such issues are of concern to the population…. Solution? Don’t buy anything manufactured by a big company. Investigate the companies you buy from. Even small companies that developed good reputations through years past have been bought out by mega corporations. “Natural” is the new buzz word; it does not mean organic. Buy everything you can organic, locally grown, non-GMO. When all people buy is organic, farmers and corporations will catch on. As this film points out – farmers are victims of their own poison use. What pesticides do to bugs, they eventually do to us. By training, I am a plant biologist. In the early 1990s I was busy making genetically modified plants (often called GMOs for Genetically Modified Organisms) as part of the research that led to my PhD. Into these plants we were putting DNA from various foreign organisms, such as viruses and bacteria. I wasn’t, at the outset, concerned about the possible effects of GM plants on human health or the environment. One reason for this lack of concern was that I was still a very young scientist, feeling my way in the complex world of biology and of scientific research. 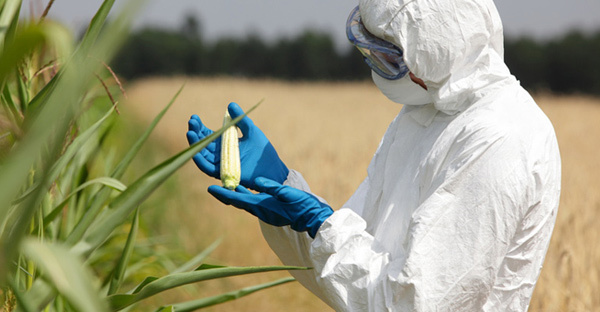 Another reason was that we hardly imagined that GMOs like ours would be grown or eaten. So far as I was concerned, all GMOs were for research purposes only. Gradually, however, it became clear that certain companies thought differently. Some of my older colleagues shared their skepticism with me that commercial interests were running far ahead of scientific knowledge. I listened carefully and I didn’t disagree. Today, over twenty years later, GMO crops, especially soybeans, corn, papaya, canola and cotton, are commercially grown in numerous parts of the world. Depending on which country you live in, GMOs may be unlabeled and therefore unknowingly abundant in your diet. Processed foods are likely to contain ingredients from GMO crops, such as corn and soy. Most crops, however are still non-GMO, including rice, wheat, barley, oats, tomatoes, grapes, beans, etc. For meat eaters the mode of GMO consumption is different. There are no GMO animals used in farming (although GM salmon has been pending FDA approval since 1993); however, animal feed, especially in factory farms, is likely to be mostly GMO corn and GMO soybeans. In this case, the labeling issue and potential impacts are complicated even further. Problem is, the same “chemical soup” that is suspected to produce problems such as developmental regression, strokes, Guillian-Barre Syndrome, death, etc (adjuvants and preservatives, such as mercury in thimerisol, aluminum, formaldehyde, etc) is injected into both the test group and the control group. In other words, both groups are contaminated by the ingredients in the “chemical soup” and there no longer is a control group. A genuine control group would be injected with distilled water and nothing else. Therefore, if the offending, debilitating effects of vaccines are due to the repetitious exposure to the “chemical soup”, then both test and control groups are exposed to the “chemical soup” and no fair test of the “chemical soup” has ever been performed – or at least released. The logic is flawed. The study is not valid. The study appears to be either very poorly designed or may be intentionally “rigged” to mislead parents, doctors, the courts, etc. Pharmaceutical corporation exemption from liability should be reversed. Companies should be responsible for their products and liable for damages they produce. Otherwise, they run wild. There is no doubt now there was a conspiracy, yet most of us are not very angry about it. The conspiracy to kill the president of the United States was also a conspiracy against the democratic system–and thus a conspiracy against you. I think you should get very angry about that. Kids got 11 vaccines in 1986 and 53 in 2017… why?